Despite the pouring rain, the mood was bright onboard the Rhode Island Fast Ferry en route to view the first steel in the water for a wind farm built by Deepwater Wind. Within the hour it took to get from the Port of Quonset where Deepwater Wind does the land-based construction work to the site, the rain had stopped and the 150 people on board went out on deck to see the enormous crane and the top of the piling that was recently placed on the seafloor. 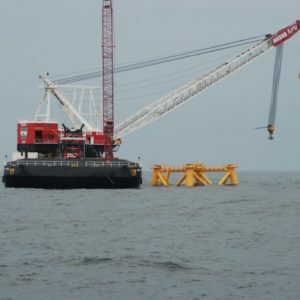 Everyone there, as well as many others, had contributed to this moment in some way and they were proud to see Rhode Island erecting the first offshore wind farm in the nation. While the visual stars of the show were the actual pilings and the members of the construction crew who lined the deck of the barge carrying the crane, the unseen but widely acknowledged headliner was Rhode Island’s Ocean Special Area Management Plan (SAMP), without which the project would in all likelihood still be in the permitting phase. Jeff Grybowski, CEO of Deepwater Wind stated succinctly, “the SAMP was critical to our success.” Governor Raimondo spoke about how the project’s success was based on collaborative planning that saved years of permitting time. The foundation of the wind farm is not only cement and steel; it’s also the science-based, stakeholder-driven ocean plan. Some of the people on the ferry were stakeholders who had engaged in the planning process such as Bill McElroy, a lobsterman and chair of the Fisheries Advisory Board, and Tricia Jedele, from the Conservation Law Foundation. There were also representatives from many of the state and federal agencies that had worked together to create the SAMP including Sally Jewell (Secretary of the US Department of the Interior), Curt Spalding (Administrator for EPA Region 1), Janet Coit (Director, RI Department of Environmental Management), and Grover Fugate (Executive Director, RI Coastal Resources Management Council and leader of the SAMP process). Representative Jim Langevin (RI-2) congratulated everyone who had a role in the SAMP and its vital role in getting turbines in the water while protecting the natural resources. The lesson of the day was summed up by Grover Fugate who touted the SAMP as a planning process that involved stakeholders, used the best science, and enabled offshore wind, one of the nation’s newest industries, to coexist with commercial fishing, one of the oldest. It was a great day to celebrate an ocean planning success by the Rhode Island SAMP and Deepwater Wind.